If you forgot your password for logging into Microsoft Surface Pro 3, here is how you can bypass Windows 8.1 Pro password so you can sign into your local or Microsoft account again. Just like Surface Pro or Pro 2, Surface Pro 3 also uses 64-bit UEFI (Unified Extensible Firmware Interface) firmware and it can boot into native UEFI mode only. This makes old-fashioned password cracking bootdisks obsolete, including Offline NT Password & Registry Editor. In this tutorial we’ll explain how to bypass Surface Pro 3 password with PCUnlocker, which supports both UEFI booting and password bypass for local/Microsoft account. How to Bypass Windows 8.1 Pro Password on Microsoft Surface Pro 3? 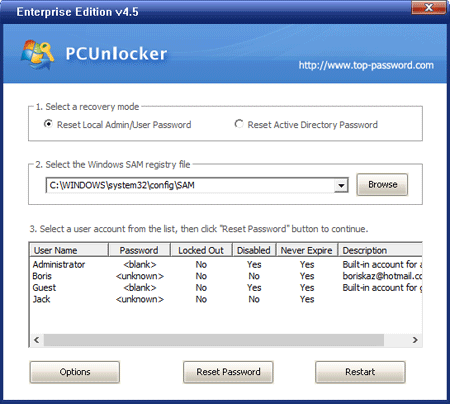 To get PCUnlocker to work, you need to use a spare PC to download the Enterprise edition of PCUnlocker which comes as a self-extracting ZIP file. Unzip the downloaded file and you’ll get a CD image called pcunlocker.iso. Burn the ISO image to your USB flash drive using the freeware ISO2Disc. Remember to choose the GPT partition style, because MBR-based bootdisk is unable to boot with UEFI mode. Once you’ve create a PCUnlocker Live USB drive, insert it into the USB port of your Surface Pro 3 tablet. Make sure your tablet is powered off at this point. Press and hold the volume-down button (on the left side of your tablet), then press and release the Power button (on the top). When the Surface logo appears, release the volume-down button. Surface will boot from your USB drive. After loading the Windows 8 PE from the USB drive, you’ll be taken to the PCUnlocker program. It shows you a list of local accounts that is extracted from your Windows 8.1 SAM registry hive. If you use an email account for signing into your tablet, you can see your email address in the “Description” column of the associated local account. Select a local account and click on Reset Password button. It will bypass / reset your forgotten login password in no time. If you’ve chosen the local account associated with your email address, the program will assign a new password for your Microsoft account login (Note: this new password can be used to log on your tablet locally). Now you’ve successfully bypassed Windows 8.1 Pro password on your Surface Pro 3. Restart the computer and disconnect the USB drive, you can then log on your Surface without a password!